I went to see the New York Mets this past Sunday with my inlaws, Bill and Norma, and my wife Connie. Lifelong Mets fans all. Bill has been rooting for "the Amazins'" since their first season in 1962, back when they had players so inept that their manager, Casey Stengel remarked, famously, "Can't anyone here play this game?" If you're not a baseball fan you may not know that in 1962 the Mets lost 120 games, still the record for the worst season in history. They were lovable losers with players like Choo Choo Coleman and Marvelous Marv Throneberry. The franchise was created to offset the fact that New York City lost two baseball teams to California–the Dodgers and the Giants. Now the Mets are celebrating their fiftieth anniversary and they're fighting to be respectable with a cast of young players and some old fashioned grit. No matter what happens they won't lose 120 games. 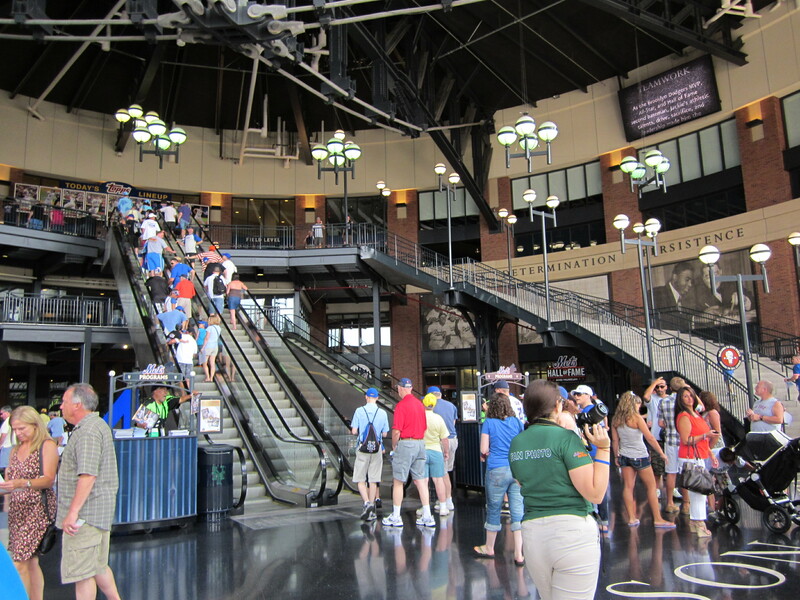 Pictured above is the rotunda to Citi Field, which is essentially a museum honoring the memory of Jackie Robinson, the first African-American player to be signed by the all-white major leagues. The entrance to Citi Field is stunning, both as a piece of architecture, but also as a civil rights memorial. I do not know of any other professional sporting team that honors civil rights in their stadium. Tell me if you know? Let's go Mets! Um, Steve, you forgot to mention the luck you brought with you on Sunday. The Mets got clobbered 7-0. Did you go to the Shack Shake? And, yes, the Rotunda is beautiful. It is a great stadium. Wish I could afford to attend more games.